Nick Hornby (author of High Fidelity, About a Boy, Fever Pitch) penned the lyrics and Ben Folds (epic songsmith) composed the songs. With a dozen new tunes on “Lonely Avenue” and 4 stories by Nick, why not order you and everybody you know with good taste a Deluxe Package of the album today?! 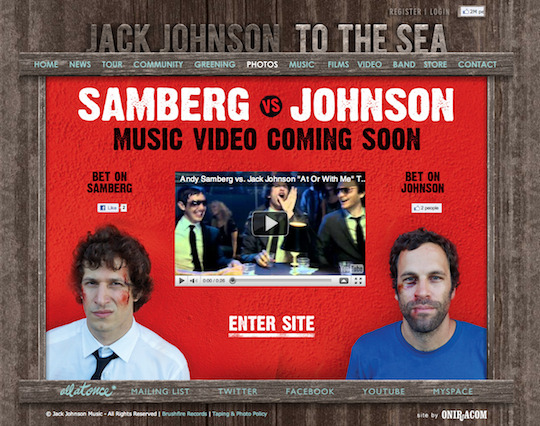 Jack Johnson’s “At Or With Me” Video Premiere… Who won - Samberg or Johnson?!! The video centers around an “altercation” between Jack and Andy Samberg, who plays an anti-Jack Johnson version of himself. We created a “Samberg vs. Johnson” campaign on JackJohnsonMusic.com in which fans could check out the preview of the video and place their “bets” on who would win in this epic battle. Bet’s were placed by clicking the “like” button under either Andy or Jack, and by doing so, it would show up on the voter’s Facebook profile and in the newsfeed of their friends. From there it continued to go viral! The campaign was a huge success and a whole lot of fun, almost as fun as the video itself!! Enjoy an interview for “Solutions for Dreamers : Season 3” by Oniric Records’ Executive Producers Jacob Tell & Brendan Moore. “SFD Season 3” is a benefit compilation album for The World Food Programme. Thank you to Santa Barbara’s KCSB 91.9FM for airing the interview on September 7, 2010. You will hear two songs within the interview segments: “A Step For Mankind” by The Wailers feat. Duane Stephenson & Bishop Lamont and secondly, “Mr. American” by Marc B. We are proud to announce Solutions for Dreamers : Season 3, the latest benefit compilation CD from Oniric Records, is now available on iTunes! All proceeds from the album are being donated to The World Food Programme (WFP), an incredible organization that fights hunger worldwide. The album features the single “A Step for Mankind” by legendary band The Wailers, featuring Duane Stephenson and Bishop Lamont. 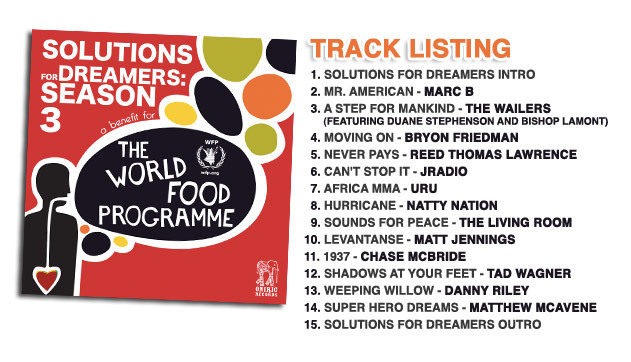 Thirteen great tracks are accompanied with factoids about world hunger and The World Food Programme, showing this album’s strong passion to creating a difference in this world by taking care of its inhabitants. We at Oniric Records would like to thank each of these artists for their passion to fighting world hunger and for their generous time and effort in creating these tracks for our compilation. Each of these artists is generously donating the proceeds of their track’s sales to WFP, so we strongly recommend you go support these artists and buy more of their music if you enjoy it! Thank you for listening, and we genuinely hope you enjoy. click here to download Mr. American by Marc B! In Apple’s Keynote this morning, they launched a much needed upgrade to iTunes that includes social integration. Much like current sites Rdio and Last.fm, iTunes is finally getting a social overhaul that will transform iTunes into a music discovery social network called Ping. You can now “follow” your friends to see what they are listening to and share recommendations - all without leaving iTunes. Initial reports indicate that Ping only displays data for albums purchased, NOT listening data. I have yet to confirm this first hand, but if true, this is a big disappointment from Apple’s latest social endeavor. If Ping only displays what albums your friends purchase off the iTunes store, they are missing out on a huge amount of data and interaction with listening data. Without listening data in Ping, last.fm will still thrive. What does Ping mean for artists? Much like Facebook’s News Feed, when you go into iTunes Ping, you will see an activity stream that includes recent activity from the friends that you follow. In addition, artists will now be able to post updates that are delivered to this news feed for people that follow them. This is huge. In the keynote, they showed an example of Jack Johnson posting some recent pictures from his upcoming music video, and Lady Gaga sharing a video blog. What does this mean? You now have another outlet to push content through. Time will tell if Ping will be a major player in the social game, but for now, you’re better safe than sorry by being on it. iTunes has a lot of customers. I am currently getting access to accounts for our clients, but am unable to disclose how to get access for your artist in order to post. I will disclose when I am allowed! I was really hoping iTunes was going to go “to the cloud” on this upgrade. These social integrations are great, but I won’t be using them much because I’m sticking with Rdio’s subscription service. I much rather pay $10/month and get unlimited streaming to an enormous catalog of music on my computer and mobile than start buying albums for $10 a piece on iTunes again. Until iTunes goes to the cloud and starts offering a subscription streaming service (or until Google beats them to the punch), my loyalty still lies with Rdio.